Medical Conditions Wallace was suffering from a brain tumor at the time of her disappearance that often caused her pain. It's unknown whether the tumor was benign or cancerous. She had had surgery for the tumor and was scheduled for a second surgery in December. In spite of her medical condition, however, her mind was unaffected and she was behaving normally. Distinguishing Characteristics Caucasian female. Red hair, hazel eyes. Wallace has a mole on the top of her right foot and a tattoo of a dolphin on her upper left arm; a photo of the tattoo is posted with this case summary. Her ears are pierced and she has one crooked tooth that shows when she smiles. She may use the last names Emerich and/or Walz, and her maiden name is Altimari. Wallace was last seen in the vicinity of west Chewalla Creek Drive in Eufaula, Alabama on October 27, 2012. Her husband stated they had an argument and at 1:00 p.m. he took their daughter to his mother's house, and while they were gone, Wallace packed a bag and left on foot. She never arrived at work that day and has never been heard from again. Her mother reported her missing. Wallace and her husband had filed for divorce just days before she went missing. 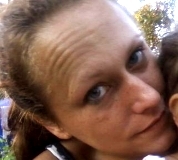 Her loved ones believe she met with foul play, as they don't think she would have abandoned her daughter. Her case remains unsolved. Updated 2 times since October 12, 2004. Last updated March 22, 2018; picture added, details of disappearance updated.